Heavy metal Cr3+ has been regarded as a threat to the environment and human health. So it is crucial to find a rapid method for detecting Cr3+, especially for the trace amounts. 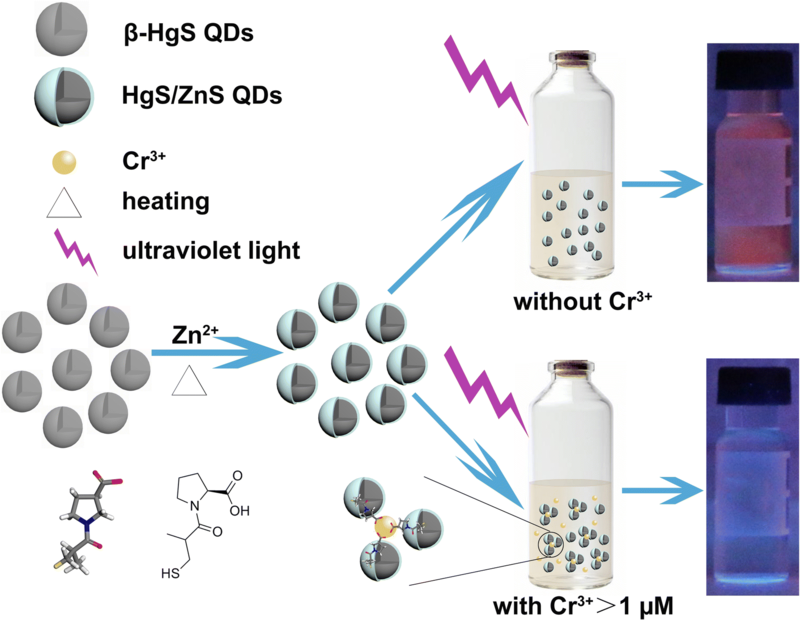 Here, HgS/ZnS core/shell quantum dots (HgS/ZnS QDs) with a quantum yield of 22.6% were synthesized as a fluorescent nanoprobe for detection of Cr3+ with a detection limit of 0.19 nM. 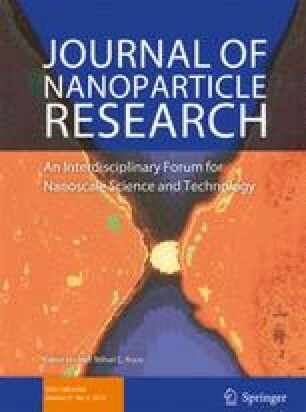 With captopril as stabilizer, the formation of the core/shell structure of HgS/ZnS QDs was demonstrated by high-resolution high-angle annular dark-field scanning transmission electron microscopy (HR-HAADF-STEM). The substantial fluorescence (580 nm) quenching of HgS/ZnS QDs which could be seen immediately by the naked eyes was induced selectively and sensitively by Cr3+, even in the case of Cr3+ mixed with other interfering ion. The HgS/ZnS QDs exhibited a stable visual response to Cr3+ from 1 μM, which just conformed to World Health Organization (WHO) standards for drinking water. Moreover, further experiments indicated that the mechanism of fluorescence quenching lied on the aggregation of the HgS/ZnS QDs. These results provide a novel insight for in situ rapid visual detection of heavy metal ions. Juncheng Wang and Guanbin Gao contributed equally to this work. The online version of this article ( https://doi.org/10.1007/s11051-019-4468-7) contains supplementary material, which is available to authorized users. The work was supported by the National Natural Science Foundation of China (21805218, 51873168, 51533007, 51521001), the Natural Science Foundation of Hubei Province (2018CFB348), the Wuhan University of Technology fund for first-class university and first-class discipline construction projects (472-20162008), and the Fundamental Research Funds for the Central Universities (WUT: 2018III023, 2017IVA093).